As one of the UK HE sector agencies our ‘co-owned’ and charitable status is fundamental to our identity. 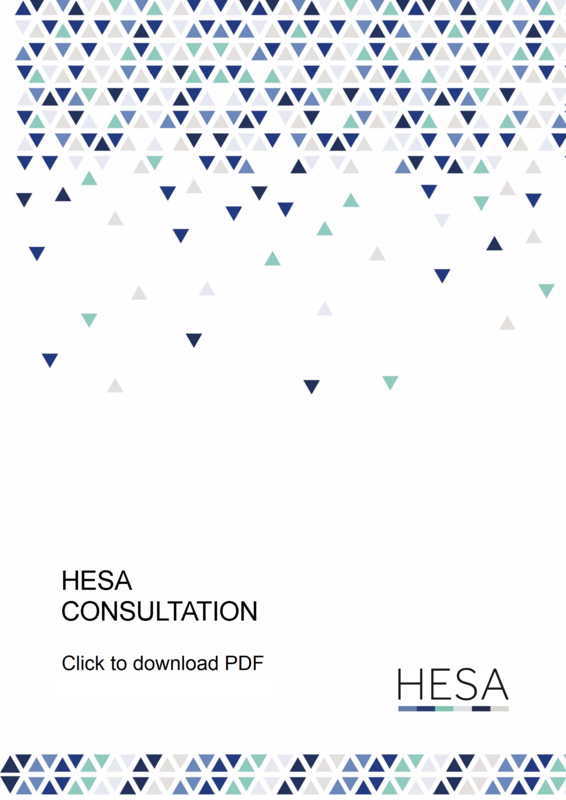 This consultation provides information about the likely statutory requirements from 1 August 2019 and is your opportunity to influence the way in which HESA shapes its non-statutory services. We welcome input from the sector, as we want to ensure that we are offering the right mix of data collection, dissemination and support services to help you meet your regulatory or statutory requirements. ​This consultation is the first stage of a wider series of engagements with the HE sector. It will run for four weeks, with the opportunity to respond online being available until 23:59 on 3 May 2019. HESA will use the output of this consultation to inform decisions about what services it offers, and what fees it charges, in future. a non-statutory subscription (this name could change) that covers non-statutory activities. These activities are for HE providers to subscribe to on a voluntary basis. The subscription model will apply from August 2019. A PDF of the consultation text is available within the consultation. You do not have to download this PDF to complete the consultation, all information is replicated within the system. We have noted some browsers and devices will not display the consultation PDF to be viewed within the page and you may have to download it. Please be assured this will not prevent you from responding to the consultation. To enable cross-organisational response, the consultation is grouped into subjects for different audiences to engage with. When you click ‘next step’ under each section, you will be returned to the contents page, which tracks your progress through the questions in each section. The ‘save later’ option, also allows multiple users from one organisation to engage with the consultation. Once you click the ‘save later’ option you will receive a unique link. Please ensure that you read all of the information supplied in each section before answering the questions. Once the required questions have been completed, a ‘Finish’ button will appear at the bottom of the consultation. Pressing this will complete the consultation and send your responses for analysis. Please do not click through to finish until you are satisfied with all of your answers. On completion, a copy of your responses will be generated as a PDF and sent to the email address you entered at the beginning of the consultation. Following feedback from HE providers, the deadline for completing the HESA Consultation has been extended to 23:59 on Friday 3 May.